College wide receiver John Moss must be kicking himself for not wearing Adidas on Saturday after breaking Chris Johnson’s record at the 2017 NFL Scouting Combine. The German sneaker giant made a thrilling offer before the weeklong event, which pairs the top college football players performing physical and mental tests in front of NFL coaches, general managers and scouts: Anyone breaking Johnson’s record of a 4.24-second 40-yard dash would get his own island, valued at just under $1 million. 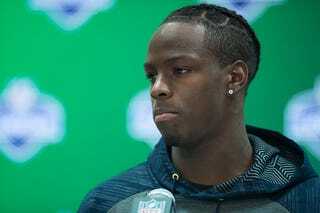 University of Washington receiver John Ross broke the record Saturday by running a 4.22 40-yard dash, but he had on Nikes. He had to be wearing Adidas to get his island. Bright spot: He’ll probably be a first-round draft pick for the NFL and land a deal with Nike. The sneaker giant promptly took to Twitter to crow about the win.